Today, Manila Bulletin featured the Azkals. 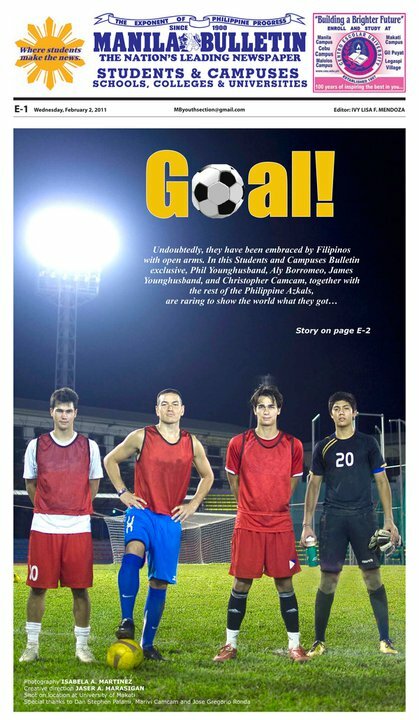 Seeing how football has struggled to be recognized as a sport that Filipinos can be proud of, I’m beyond ecstatic that local media and pinoys in general are slowly catching the football fever and giving the world’s greatest spectator sport the much deserved support. It may not be in the same level as basketball yet, but if all goes well, we’ll get there. I still remember the days where if you want your dose of football news and updates, the only sources are the internet and cable TV. But what you get are just the international football news, local coverage are rare, if not, almost non-existent. When I was still a newbie fan, World Cup news would only get a 3-small-paragraph coverage (if you manage to find one) in the local newspapers. Oh how the times are slowly changing. The azkals are not only getting media attention but they’re also getting more funding from local and international institutions and—more female fans and groupies!